Thrice a three-sided site by the Bank of England has changed the history of post-war British architecture. First, with the promise (or threat) of a Mies van der Rohe London skyscraper, secondly with Prince Charles’ opening salvo of his war on contemporary architecture, and finally with a James Stirling masterpiece that marked the tail-end of postmodernism’s golden period. Circling the Square brilliantly opens up the story of Mies’ and Stirling’s plans, and touches on some — but not all — of the issues and context. Curator Marie Bak Mortensen says the exhibition ‘tries not to pass judgement’. A recap for those shaky on history: Property developer Peter Palumbo, smitten with the architecture of Mies van der Rohe, travelled to Chicago in 1962 and asked him to design for the site on which his family was acquiring leases. Speaking at the RIBA, Palumbo said that Mies ‘at once understood that it was a posthumous commission’ — he was already 76. What Mies worked up was an 88.5m-high variation on his trademark black-bronze, curtain-walled, rectilinear slab-with-plaza, just like his instant icon of high modernism, the 157m-high Seagram Building in Manhattan (1958). Mies died in 1969, the same year planning permission was granted. But a battle was brewing with the heritage lobby, outraged to lose the Mappin & Webb building (1870) — almost London’s own, smaller Flatiron building, but fancier and with a clock — and eight other listed Victorian properties on the site. Palumbo had all his leases bagged in 1980, but a long public enquiry followed. Prince Charles made his infamous ‘carbuncle’ speech in 1984. That word actually referred to ABK’s proposed National Gallery extension, but the speech also damned Mies’ tower as ‘a giant glass stump’. Environment minister Patrick Jenkin finally killed it a year later. 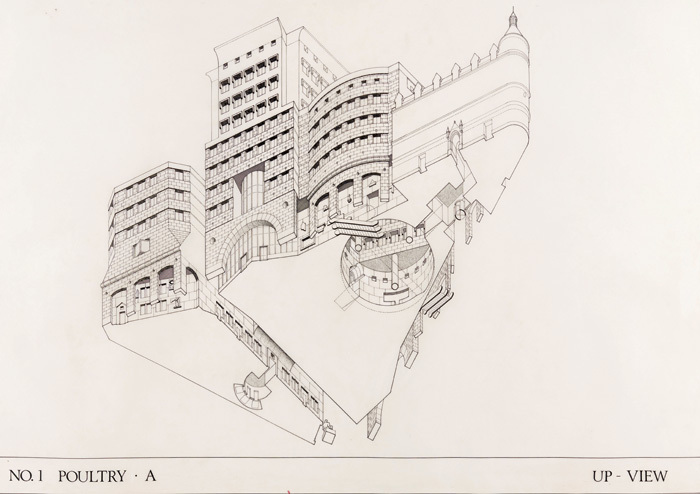 Palumbo rallied and recruited James Stirling (who had defended the Mies’ design) to make new plans. His big playful proposal was subjected to a 1988 public enquiry, and Number One Poultry was approved the next year. Stirling died in 1992 and his swansong was completed in 1997. It was listed last year. After passing an inclined Eighties’ model of the City (then dominated by Seifert’s Tower 42), we see portraits of the architects before we enter the exhibition main space. Mies in 1959 is blithely assured with his cigar and a RIBA Gold Medal around his neck, while Stirling in 1986 is absorbed in drawings, almost disappearing into the gloom of his office. RIBA medals run through the story, although the show barely references them. Stirling received the 1980 one, and Mappin & Webb architect John Belcher the 1907 one — unlike unfortunate Charles Correa, their award events were not totally hijacked by any royal outburst. The main space is designed by Carmody Groarke, all white with floating tables. It hosts a treasure trove of documentation, but the stand-out exhibit is a giant 1:96 model of the Mansion House Square scheme. The tower stands almost 1m high, and so detailed, there are even office chairs inside it. All around it is meticulously modelled too, including the now-demolished Bucklersbury House (1958) to the south, the first City office block higher than 50m, here dwarfed by the sleek would-be newcomer. 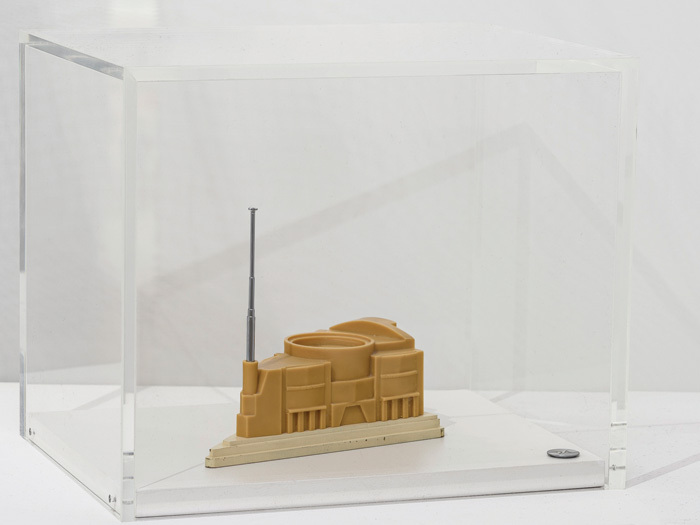 This is the model that Palumbo kept in his personal study, and in a looped video, we see him in a full 1985 episode of Omnibus, savouring it like a supreme leader might a model of a planned utopian capital. Prince Charles’ carbuncle speech is also video looped. Another large model, unearthed from storage in Pennsylvania, shows the Mies plan’s underground shopping centre, again with extraordinary detail, such as a figure of project architect Peter Carter, seen in his habitual yellow motorbike gear. In the days before CGI renderings, montage was sometimes used, and the great architectural photographer John Donat was a master of it. We see how he contrasts the black-brown of the slab with the grey City buildings, as if it promised to warm up the stuffy old place. A boatload of great architects and critics of the Eighties favoured the Mies’ scheme, and we see some of their letters and televised learned opinions. This cultural divide between a metropolitan elite of experts and a self-appointed populist may sound like an echo of contemporary politics, but it was not so clear-cut. The Omnibus programme slanted the story against Mies without relying on Prince Charles. The feisty chairwoman of the Victorian Society is given much footage, and ominous warnings about sick building syndrome and wind vortices around skyscrapers are aired. Even among architecture’s greatest, there was a surprise dissenter — a letter from Philip Johnson says Mies is great but the scheme is wrong for London. It was Johnson who included Mies in the pivotal 1932 Modern Architecture International exhibition at MoMA. All this material is gold, but it stays resolutely focused on the site. Interesting but relevant things were happening away from it. Mansion House was not Mies’ only defeat in Europe. For the Commerzbank headquarters in Frankfurt in 1968, he designed a 127m-high tower and adjacent square pavilion suggesting his Neue Nationalgalerie, Berlin. That was for an architectural competition, and Mies lost. Things moved quickly in Frankfurt — the winning design was in place by 1973. London never got a Mies block, but it did get two Miesianly black City towers from practice GMW — the Commercial Union Tower in 1969, and 6–8 Bishopsgate in 1981, as high as Mansion House Square but without a plaza. No other skyscraper in the City with an essentially vertical form was built until Foster’s Gherkin (not counting wider volumes like Richard Rogers’ Lloyds). International-style office towers were old hat by the Eighties anyway. The Big Bang deregulation of City trading in 1986 was just around the corner, and big floorplates would become the new normal. The Stirling side of the exhibition may seem overshadowed by Mies, but it too presents a story with plenty of punch. 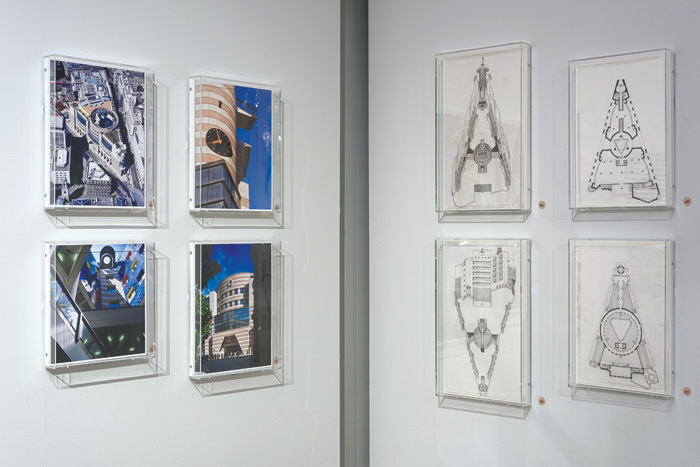 When Palumbo commissioned Stirling, the postmodernist was at the height of his powers, with the acclaimed Stuttgart Neue Staatsgallerie (1983) and the Sackler Museum, Harvard (1985) recently completed. Palumbo’s development was now called One Poultry (an early use of ‘One’ to brand a scheme). Stirling’s practice made a photo survey of surrounding City buildings. 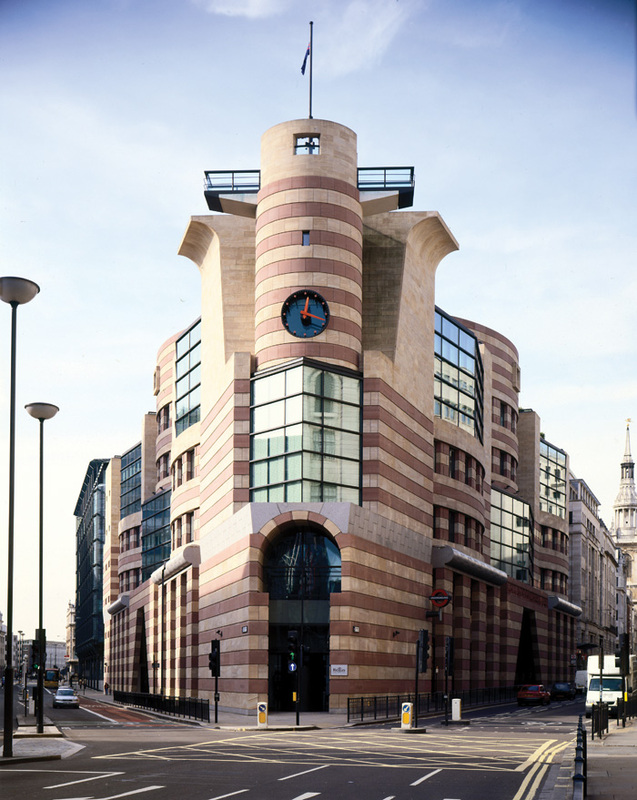 Included is St Mary Woolnoth (1727), which has a stratification and eclectic mash of forms that One Poultry would echo. The church shows Hawksmoor typically spelling out the high postmodernism formula 250 years in advance. At first, Stirling preserved Mappin & Webb, but included an overwhelmingly bulky block looming behind it. After 1986, it was decided everything would be demolished. Stirling’s final scheme is revealed in not just models but axonometric ‘worm-eye view’ drawings. These perspectives from underneath baffled many - and Royal Fine Arts Commission secretary Norman St John Stevas demanded Stirling present understandable drawings. Prince Charles compared Stirling’s design to a Thirties’ radio, causing Palumbo to commission One Poultry radios. We see one with its aerial up, reaching an equivalent height at least matching Mies’ tower. We may draw our own conclusions from this excellent exhibition. One of them should remind us that if an architect is seen as a genius, inevitably they’ll soon be considered tired if not rubbish, then later they’ll be loved again. And the way we work and use space also changes, for example with the Eighties’ need for trading floors, so even the best designs can be rendered redundant. Imagine if Palumbo’s site was being developed today, say as the ‘Bank Accelerator’, to lure fintech start-ups. That eclectic, organic jumble of demolished Victorian spaces would have been just the ticket.